On the back of Stephen Colbert’s merciless and relentless skewering of president Donald Trump, CBS’ The Late Show With Stephen Colbert has done the unthinkable. For the first time in over 20 years, CBS is leading the charge in late-night programming. It’s a slim margin—The Late Show bested NBC’s The Tonight Show by a scant 22,000 viewers—but the victory is nonetheless impressive for a show that was barely treading water a year ago. Around this time last year, Colbert was meeting with the heads of CBS and talking about potentially being removed from the show. The tide turned almost as soon as Trump took office. As Trump’s administration became beset with scandals and hilariously misguided cover-up attempts, Colbert—more than any other late-night host—took it upon himself to take the White House to task. It was a risky move and one that stood in stark contrast to Fallon’s controversial hair tousling from before the election. 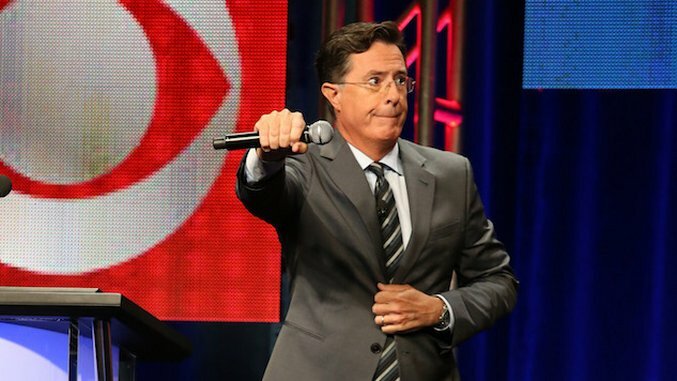 Fortunately for Colbert, it appears to have paid off, as The Late Show rode increasing traction from February to its eventual ratings win. Despite the win in overall ratings, Jimmy Fallon’s show still manages to wreck Colbert’s in the most coveted audience category. Advertisers care more about adults aged 18-49 than any other demographic, and Fallon won this group with an average .81 rating, significantly outperforming Colbert’s .58 rating, per THR. While more people may watch The Late Show, they’re likely not getting as many well-placed advertisements for aromatic soaps or Marvel movies as Fallon’s The Tonight Show. So in the end, it’s all a wash.
Watch a few of Colbert’s skewerings of Trump here and here.